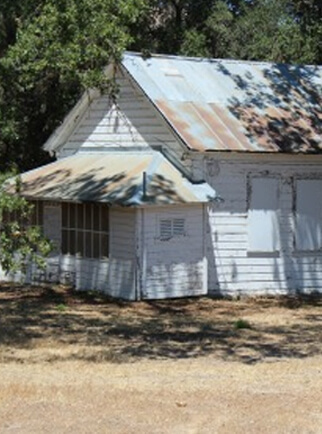 The historic Bear Valley School lies on roughly one acre of land in southern San Benito County at Pinnacles National Park Foundation eastern boundary. The Bear Valley Schoolhouse was constructed in 1903 on land that was donated by Dr. Americus Powers, one of the earliest American settlers to homestead in this rural valley at the eastern foot of the Pinnacles. The one-room, wood-frame structure was the principal school serving the local community for the next 50 years. A commemorative valley oak tree was planted in 1923 for long-time Bear Valley School teacher Horace Bacon and still exists today. The building also functioned as the nucleus of the community’s social life, serving as gathering hall for many events. It continued in this role even after it ceased to function as a school in 1950. The building was shuttered in 2002 due to its deteriorating physical condition. Nonetheless, the building remains structurally sound and retains its historic integrity, having never been moved or substantially modified. It continues to hold strong emotional and historic associations for local residents, many of whom are descended from the first generation of settlers who went to school here as children. The National Park Service acquired the school in 2011 in order to preserve this important part of area history. a) Complete a Historic Structure Report to document the physical history of the building and determine appropriate preservation treatments to uphold its historic integrity (Progress: 90% complete; expected completion 2016). b) Submit a “Determination of Eligibility” for the National Register of Historic Places to the California State Historic Preservation Officer (Progress: 100% complete; the CA State Historic Preservation Officer agreed that the Bear Valley School is eligible for the National Register on February 19, 2014). c) Submit Nomination to the National Register of Historic Places to Washington DC (Progress: 100% complete. BVS is now on the National Register for Historic Places http://www.nps.gov/nr/feature/places/14000267.htm ). d) Raise private and public funds towards rehabilitating the Bear Valley School. The site will be used for education purposes and continued use as a community center. (Progress: ongoing; the Pinnacles National Park Foundation holds some private funds that have been raised towards building rehabilitation; NPS funds have been requested but not yet confirmed). e) Conduct oral history interviews – engage the community to share their stories and reflections of the Bear Valley School. (Progress: some interviews have been conducted; currently writing grant proposals to help support a professional oral history project that will be archived and used as a primary source for how the building and period of significance (1903-1950) to current day has impacted our community.